CBD (Cannabidiol), also referred to as Hemp oil, hemp derived CBD oil, or hemp extract, is one of many non-psychoactive phytocannabinoids found in the hemp plant. CBD is the second most abundant cannabinoid found in hemp behind THC (tetrahydrocannabinol). CBD is non-psychoactive, therefore non-intoxicating. Whereas THC is psychoactive, and remains illegal in most states. CBD is derived from industrial hemp, and to be considered as industrial hemp, the plant cannot contain more than 0.3% THC by dry weight. 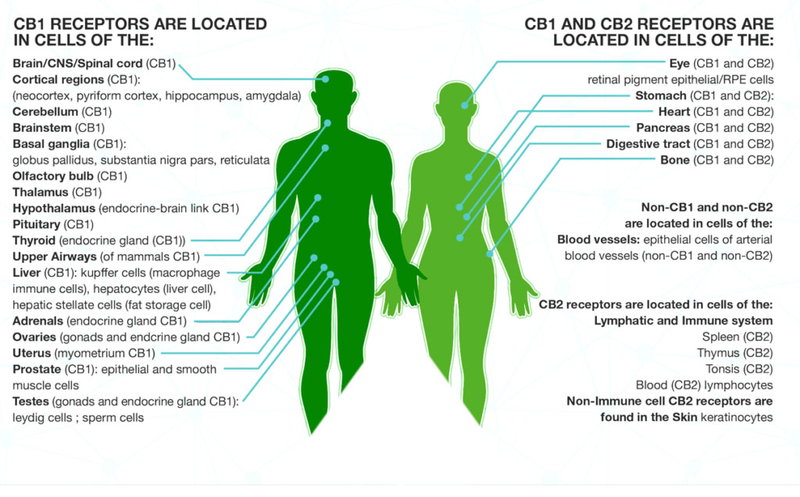 How CBD oil works in the body. CB1 receptors Regulate memory, mood, sleep, appetite, and pain sensation. When CBD oil is consumed, endocannabinoids bind to these receptors, impacting mood, memory, appetite, pain, sleep, and many more. For wellness and good health, homeostasis must be achieved and CBD influences this through its interaction with the EDC system by affecting the brain and central nervous system. If the EDC system is out of balance, it can result in a number of symptoms such as inflammation, chronic pain, and other more serious conditions. HOW DOES CBD FUNCTION IN A SALVE? CBD in a salve translates at a functional, cellular level and doesn’t require traveling through multiple stages of absorption. The skin is the largest organ in the human body and acts as a major passageway to quickly absorb Current Naturals CBD salve in the bloodstream. When rubbed into the skin directly, our salve can help issues directly below the skin, including pain, muscle soreness, tension, and inflammation. WHAT CBD CAN DO FOR YOUR PET(S)? Because pets also have an EDC system, CBD provides all of the same benefits for dogs as it does for humans. Cannabinoids bind to receptor sites in your pet’s EDC system, stimulating the nervous and immune system to create optimum energy balance. Our CBD Pet Chews have pain-relieving properties and the ability to reduce anxiety or stress of separation in your pet. Softgels make for the perfect on-the-go nutritional supplement, as they are the easiest and most convenient way to take CBD. They absorb in the bloodstream at a faster rate than other forms of CBD and influence the body’s natural functions including mood, sleep, appetite, and immune response. Current Naturals CBD Softgels exhibits thermal stability and come in a measured dose of CBD made with pesticide free, non-gmo, proprietary water soluble hemp oil. CBD tinctures are liquid extracts that have been around for many years. They are used sublingually, meaning under the tongue, and contain therapeutic properties that deliver immediate relief of symptoms related to pain. Current Naturals CBD tinctures are whole-plant extracts and contain a broad-spectrum of naturally cannabinoids and terpenes. Customers are able to simply take a few drops to their daily supplement routine to enjoy all of the health benefits CBD has to offer. Unlike endocannabinoids and artificially manufactured cannabinoids, phytocannabinoids are found in the cannabis sativa plant and can be used to supplement or replace endocannabinoids inside our bodies when a deficiency is present. This is caused by phytocannabinoids activating CB1 and CB2 receptors in the body, which regulate cognitive and immune functions. Known as THC, this is the most potent psychoactive agent identified to date in cannabis. This cannabinoid is commonly associated with the intoxicating or “high” feeling consumers feel. Known as CBD, this is a non-intoxicating constituent found in hemp and marijuana varieties of cannabis. It represents half of all cannabinoids in the cannabis sativa plant, with its effects being studied worldwide. Cannabis is derived from the hemp plant with two different strains, cannabis sativa and cannabis indica. Of the elements in these strains, cannabis has dozens of types of cannabinoids, which are chemical compounds. Terpenes found in cannabis gives it a unique smell and contributes to phytocannabinoids by binding to receptors in the brain like cannabinoids and giving rise to therapeutic effects. In order to be considered hemp, a cannabis sativa plant must contain less than 0.3% THC. It’s as close as you can get to how cannabis grows naturally and bred for numerous commercial products like clothing, textiles, industrial materials, and food among other things. However, unlike marijuana, hemp contains more CBD and lacks THC so you won’t feel intoxicated or “high” when consuming. Marijuana is the potent resinous glands (trichomes) that grow on the dried leaves of the cannabis sativa plant and has higher levels of THC compared to hemp. It has been grown for medical and recreational purposes for many centuries, containing over 400 chemicals with THC as the key psychoactive ingredient.